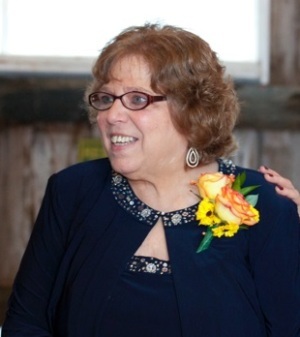 Obituary for Pamela Anne (Lindquist) Allegretti | Doolittle Funeral Service, Inc.
Pamela Anne (Lindquist) Allegretti of Higganum passed peacefully, surrounded by family, on Tuesday, April 9, 2019, at Lowell General Hospital in Lowell, MA. Born November 5, 1949 in Middletown, she was the daughter of the late Roger W. and Theresa H. Lindquist. She was raised in Cromwell and graduated Mercy High School in Middletown in 1967. Early in her career she worked in human resources at Aetna in Hartford. After taking time off to be a stay-at-home mom, she was employed at Equifax and Abacus, both in Rocky Hill. She then went on to work in customer service at Biosystems (later Honeywell) in Middletown, eventually becoming Customer Service Supervisor. She retired in 2013. For many years, Pam worked part time at the Cromwell Belden Public Library; she made many wonderful friends there are often said it was the most rewarding job she ever had. Pam was formerly a member of St. John’s Church in Cromwell where she taught CCD, confirmation classes and was a eucharistic minister. She was also a member of the Guardian Angels Mother’s Circle, a group from which she drew great satisfaction and joy. Prayer remained an integral part of her life. Pam was a true child of the 60’s, she adored the culture of the generation and capped it off by being at Woodstock with her younger sister. She even lived in the Bay Area of California for a year in the early 70’s. She loved music—from the Beatles, The Moody Blues, CCR, and Led Zeppelin to Beethoven and Tchaikovsky to Katy Perry. She had a passion for cooking, which inspired her son to pursue it as a career. She enjoyed reading, dining out, wine tasting, going to the movies, and traveling to New Hampshire and Maine (where she spent countless summers). She enjoyed fishing and was quite an angler. Pam was a fan of all New England sports team, particularly, the Red Sox. She was a politics junkie, and, like her father, enjoyed spirited political debates. She was an excellent croquet player and won the coveted crystal bowl at The Ladies Croquet Party multiple times. She often had several games of Words with Friends going on at any given time. Above all else, she loved spending time with her son. She loved making meals with him, sipping on Manhattans with him, talking about politics with him, and just enjoying each other’s company. Her greatest joy in life was being a nana to her identical twin grandsons, Charles and Warren, whom she dubbed “Nana’s angels.” She loved nothing more than playing with them, reading to them, and watching Daniel Tiger’s Neighborhood with them. She savored and cherished every moment she had with them. She is survived by her son John, his wife Haze, and their sons Charles and Warren of Chelmsford, MA; two sisters, Patricia Schwarm of Portland and Margaret Maine and her husband Russell of Clinton; and many nieces, nephews, great nieces and great nephews. She also leaves two very special friends, Kathleen Ptaszynski and Maureen Donahue. She was the sister of the late Roger E. Lindquist. Friends may call at the Cromwell Funeral Home, 506 Main Street, Cromwell, CT 06416 on Thursday, April 18, from 5:00-6:30 pm followed by words of remembrance at 6:30pm. Donations in her memory may be made to the Beth Israel Deaconess Medical Center NICU in Boston to honor and help the place where her grandsons spent the first 6 weeks of their lives. https://www.bidmc.org/give. To share memories or send condolences to the family, please visit www.doolittlefuneralservice.com.